Paper Monsters: Recut is a 2.5D platformer that was originally released on mobile devices as Paper Monsters, but has been rebuilt from the ground up for the Wii U by the developer of the game Mobot Studios! Does the game possess enough depth for a console platforming title or is it better suited for mobile devices? Keep reading to find out! 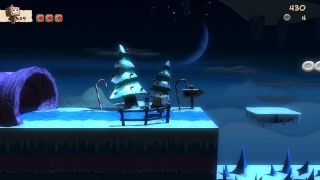 The gameplay of Paper Monsters: Recut is quite similar to that of Sony's first party platformer Little Big Planet, except the pre-made stages are a little more enjoyable and the game lacks a level creator. You basically traverse stages collecting buttons, lives, golden paper clips, and the one golden button in each stage to rack up points in this 2.5D collectathon platformer! The stages are unique and their design is quite impressive for a game that isn't AAA! Paper Monsters: Recut also has an overworld map that's filled with collectables and secret stages to find which helps add to the replay value of the game! The only issue we really had with this game aside from a few bizarre random bugs that weren't game-breaking was the lack of difficulty. The game is just too easy with laughable enemies and equally weak bosses it felt like one of those EC3+ platformers that are meant to introduce toddlers and young children to games which really hurts this game's score. If not for this one issue Paper Monsters: Rucut would have likely received an additional two points added to its score, but regardless of this fact it's still a solid game and that has enough variety in its stages such as having submarine shooting stages, bobsled stages, etc. which was a pleasant surprise! The controls are easy to learn and don't feel awkward while the Off-TV Play is a great feature that works flawlessly in this game! The graphics look incredible for an indie title as the game features superb lighting and shadow details, detailed 3D character models and objects that look like they belong in a retail title, and other special intricate details that most players might miss in the background! The sound effects are fairly generic, but work well with the game while the music, while decent was for the most part forgettable which is somewhat disappointing, but doesn't affect our opinion about the game all that much. 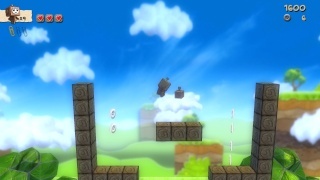 With fun gameplay that has alot of variety, smooth controls, and incredible graphics Paper Monsters: Recut is a great game that feels like it should have been a retail title, however its extremely low level of difficulty and forgettable soundtrack hold the game back from reaching its potential, but if you own a Wii U and enjoy platforming titles we give Paper Monsters: Recut a solid recommendation! To be honest I didn't have high hopes for this game, but it seems to be much better then I thought it would be lol. Megatron would approve of your review! I already downloaded this gem and it's way better than I thought it would be though I agree that the game is too easy. Nice review.